In skillet, brown hot dogs in butter (or grill). Warm tortillas in the microwave for about 30 second. Place one hot dog in the center of each tortilla and top with 1/8 cup of shredded cheese. Fold sides of tortilla inward to cover each end of the hot dog. Next, fold bottom end of tortilla upward covering the entire hot dog and continue to roll, keeping sides tucked in tightly. 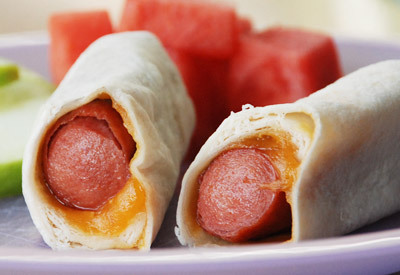 Wrap each hot dog wrap in a paper towel and microwave, 1 or 2 at a time, on HIGH for 30 to 45 seconds. Salsa or ketchup can be served for dipping.